A group of Heath Ledger fans have taken their reverence for the late "The Dark Knight" star to a whole new level. Followers of the actor, who electrified audiences with his chilling reinvention of the Joker in the second Batman blockbuster, are calling for the character to be retired from the movies permanently. 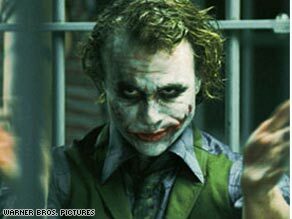 Ledger supporters at new Web site, The Ultimate Joker, launched a petition last week calling for studios to remove the Joker from any future Batman movies. The petition currently has 2,431 supporters. “We think Heath deserves this honor,” the site’s team leader, Fer Barbella, told CNN from Buenos Aires, Argentina. “He is the ultimate Joker. “We are Batman fans from the comics and from the movies,” he said, “After we saw ‘The Dark Knight,’ we thought this Joker was really the best. It deserves to be withdrawn from any Batman sequels. “When Michael Jordan retired, they withdrew the number 23 jersey as an honor. It’s the same thing with Heath.” Barbella said he thinks any new performance just won’t be able to top Ledger’s.